SAN FRANCISCO, CA — March 26, 2018 — About 40 percent of Americans report skipping a recommended medical test or treatment and 44 percent say they didn’t go to a doctor when they were sick or injured in the last year because of cost, according to a new national poll from NORC at the University of Chicago and the West Health Institute. The February survey of more than 1,300 adults offers new insights into how Americans feel about the costs of healthcare and how they report those costs affect their medical decisions and personal finances. 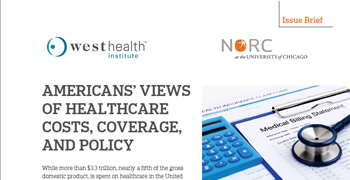 While $3.3 trillion was spent on healthcare in the U.S. in 2016 – 17.9 percent of Gross Domestic Product – the new national poll finds three-quarters of Americans do not think we get good value for what our country spends on healthcare. These results are being presented today at the American Society on Aging 2018 Aging in America Conference in San Francisco, and will be webcast at 1 p.m. PST (free registration required). In the survey (download issue brief or topline results), about 30 percent said that over the last year they had to choose between paying for medical bills or basic necessities like food, heating or housing. But people say they are not only facing tough choices; they are scared. More people fear the medical bills that come with a serious illness than fear the illness itself (40 percent vs. 33 percent). Those who reported skipping a recommended test or treatment were about two times more likely to fear getting sick (47 percent vs. 24 percent) and to fear the costs of care (60 percent vs. 27 percent). The survey also revealed Americans are not only delaying but also going without recommended care such as tests, treatments and doctor visits. About one-in-three respondents report they did not fill a prescription or took less than the prescribed dose to save money. Dental care also suffered. Nearly half say they went without a routine cleaning or check up in the last year, and 39 percent say they did not go to the dentist when they needed treatment. More than half of survey respondents report serious financial consequences due to the costs of healthcare. Thirty-six percent say they have had to use up all or most of their savings, 32 percent report borrowing money or increasing credit card debt, and 41 percent say they decreased contributions to a savings plan because of healthcare expenses. Some healthcare bills came as a surprise to many Americans. Over half of respondents said they received a medical bill for something they thought was covered by their health insurance, and a similar proportion reported receiving a medical bill that was higher than they expected. Strikingly, more than a quarter of respondents reported having a medical bill turned over to a collection agency within the past year. The West Health Institute/NORC survey found about half of Americans disapprove of the way their member of Congress is addressing the high cost of healthcare. Fifteen percent approve and about a third neither approve nor disapprove. A clear majority, 60 percent, say it’s important for their Congressional representative to spend time advancing policies to help seniors access high-quality, affordable healthcare and supportive services. Support for greater spending on Medicare and Social Security grows with age. Those over 30 are more likely than those younger than 30 to support an increase in spending for Medicare. Forty-two percent of adults younger than 30, 56 percent of those age 30-44, 62 percent of 45-59, and 60 percent of 60 and over support increases in Medicare. Support for Social Security ranges from 40 percent of those under age 30 up to 63 percent of those age 60 and older. 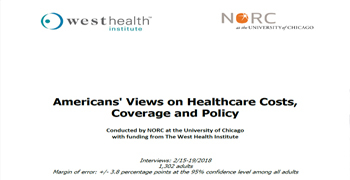 The nationwide survey was conducted February 15-19, 2018, using the AmeriSpeak® Panel, the probability-based panel of NORC at the University of Chicago. Online and telephone interviews using landlines and cell phones were conducted with 1,302 adults. The overall margin of sampling error is plus or minus 3.8 percentage points. 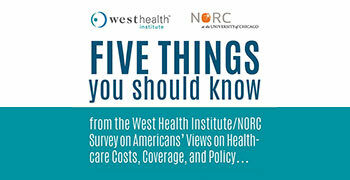 This survey was conducted by NORC at the University of Chicago with funding from the West Health Institute. NORC at the University of Chicago and the West Health Institute collaborated on all aspects of the study design and reporting. Data were collected using the AmeriSpeak Omnibus®, a monthly multi-client survey using NORC’s probability-based panel designed to be representative of the U.S. household population. The survey was part of a larger study that included questions about other topics not included in this report. During the initial recruitment phase of the panel, randomly selected U.S. households were sampled with a known, non-zero probability of selection from the NORC National Sample Frame and then contacted by U.S. mail, email, telephone, and field interviewers (face-to-face). The panel provides sample coverage of approximately 97% of the U.S. household population. Those excluded from the sample include people with P.O. Box only addresses, some addresses not listed in the USPS Delivery Sequence File, and some newly-constructed dwellings. Solely funded by philanthropists Gary and Mary West, West Health includes the nonprofit and nonpartisan Gary and Mary West Health Institute and Gary and Mary West Foundation in San Diego and the Gary and Mary West Health Policy Center in Washington, DC. These organizations are working together toward a shared mission dedicated to enabling seniors to successfully age in place with access to high-quality, affordable health and support services that preserve and protect their dignity, quality of life and independence. For more information, visit westhealth.org and follow @westhealth.